The Stoppelkamp-Allee is a rather unusual boulevard that runs for precisely 82.3 metres in front of the Benteler-Arena, home of SC Paderborn 07. It was opened in October 2014, just weeks after the man who inspired it, Moritz Stoppelkamp, had scored the club’s most famous goal against Hannover 96, from the same distance. The goal came at a high point for the club, on the day they moved to the top of the Bundesliga for the first time in their history. Less than three years later and Paderborn have fallen through the trapdoor, out of the third division into the Regionalliga and amateur football. Three relegations in three years: a feat never before “achieved” in professional German football. Paderborn put up a fight at the bitter end but by the time they started swinging it was already too late. Or at least so it seemed, until 1860 Munich inadvertently did them a favour. Having been relegated from the second tier, 1860 Munich failed to stump up the €10m needed for a license to compete in the third division. 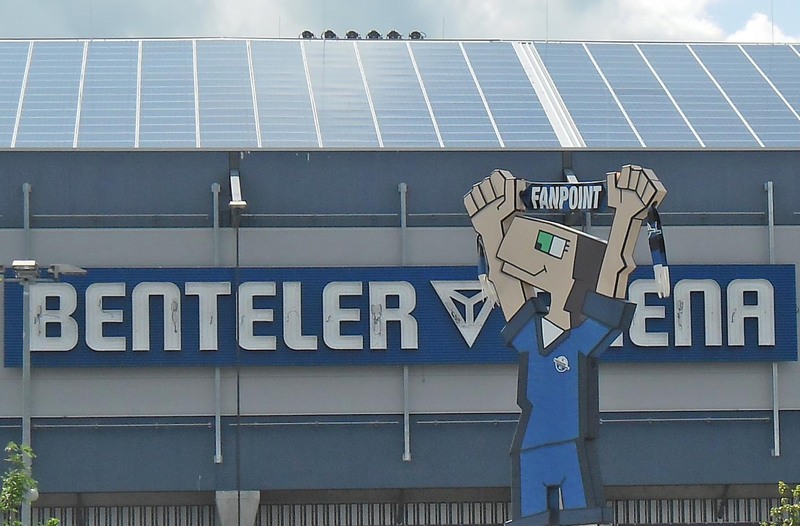 Paderborn quickly stuffed their license application into an envelope, transferred the money to the DFB and now dare to hope that the backdoor to the third tier is still on the latch. 1860’s fate may rescue Paderborn but, even if they are allowed to start next season in the third tier, the club is still at rock bottom. Speaking after their final game of the season – a scoreless draw away at VfL Osnabrück – manager Steffen Baumgart made no excuses, saying they had simply failed. Parachuted in with only a handful of games to play in April, the former Hansa Rostock striker had a simple remit: halt the slide. The team picked 11 points in his five games in charge, so it is not his fault, but they still slipped over the precipice. The club is currently swamped in gloom but the Paderborn story had been an uplifting one until very recently. The club’s roots date back to 1907 but they took on the name of SC Paderborn 07 in 1985, when three local sides merged together. Having spent most of their history in the Regionalliga, the club reached the second tier in 2005. Promotion ushered in a new era of prosperity and they established themselves as regulars in the second division, spending eight of the next nine seasons at that level. The second tier in any country is generally unforgiving and unpredictable, with a handful of teams moving through the revolving doors at both ends. Clubs have to compete with lower-league upstarts who are charging up the tables, such as Hoffenheim and RB Leipzig, while fending off big-budget giants who have bellyflopped in from above – VfB Stuttgart and Hannover 96 last season, for example. Despite the stiff competition, Paderborn made a couple of decent stabs at promotion to the top flight, finishing fifth in 2010 and 2012, before appointing freshly qualified coach André Breitenreiter for the start of the 2013-14 season. He helped them make history that season, when a second-place finish guaranteed promotion to the Bundesliga. Only a decade after playing in the Regionalliga, Paderborn were dining at the top table of German football. Despite the euphoria and the confidence everyone had in Breitenreiter, Paderborn began the season among the favourites for the drop. The players, however, had no intention of playing with their old mates in the second division and began their maiden Bundesliga campaign with a bang. They went unbeaten in their first four games – including that 2-0 win over Hannover 96, the game still remembered for Stoppelkamp’s long-distance wonder strike – to go top of the league. They only stayed there for three days but reaching the summit of German football was something to sing about. They had bolted out of the blocks but the mission was still to squeeze as much out of their early-season run as possible and survive. Next stop Munich and a 4-0 defeat. Welcome to the Bundesliga. Still, Breitenreiter’s team dusted themselves off and secured some decent results in the next few weeks, picking up another 11 points before the winter break to leave them relatively snug in 10th place at the halfway point of the season. The winter break can slam the breaks on any momentum a club has built up and give rivals time to regroup and strengthen. Paderborn started 2015 sluggishly, quickly shedding the points reserve they had collected before Christmas, and they were soon flirting with the bottom three as the Bundesliga dream turned into the reality of a relegation fight. They appeared to be sitting pretty in midtable but five of the eight teams below them were Stuttgart, Hamburg, Werder Bremen, Hertha Berlin and Jürgen Klopp’s Borussia Dortmund – all of whom were bound to improve. And so it came to pass. By Valentine’s Day, Hamburg and Bremen had leapfrogged them. And, by the time they had lost 6-0 at home to Bayern Munich, Paderborn were also watching Borussia Dortmund drift into the distance. Suddenly things began to look serious. To their credit, they did not spend a second in the bottom three until the start of March – the problem was they only spent one week out of it after then, and not the final one. They fought for survival right up until the last day of the campaign but finished a point below 15th-place Hertha Berlin and went down. The dream was over and the nightmare was about to begin. He had taken the club down but Breitenreiter’s good work had not been lost on the football world and he was appointed by Schalke. Markus Gellhaus took over as interim boss at Paderborn but he only lasted only until October, when Stefen Effenberg swapped giving his opinions in a TV studio to give instructions the touchline. Effenberg took over with the team already tumbling towards the bottom three but he did not lack confidence and said all the right things. He was typically bullish, batting away any talk of consecutive relegations. Effenberg, “the Tiger”, had been a winner in his playing career and hoped some of that mentality would rub off on his players in his first job in management. It wasn’t to be. Less than five months down the line, Effenberg had only steered the club further into trouble, eventually being relieved of his duties with Paderborn in 17th place, already five points from safety. The new man, academy coach and former Paderborn player Rene Müller came in with 10 games to stop the unthinkable: back-to-back relegations. He won nine points in those 10 games and Paderborn finished bottom of the table. Effenberg’s appointment had been nothing short of a disaster and Müller never really had a chance. Players were jumping ship and grabbing any lifeline they could, leaving the team was in constant flux, barely recognisable from the side that had performed so valiantly in the Bundesliga. After two relegations in a row, the club were in freefall. They never really got going in the third division. Müller was sacked in November after a 6-0 defeat to Sportfreunde Lotte, a club competing in the third tier for the first time in their history, and his replacement, Stefan Emmerling, was already out the door by Easter. Paderborn were experiencing the now familiar slide towards the bottom of the league. They were fighting to stay in the Bundesliga pyramid – not just with the big boys, but on the map. If Baumgart been appointed just a few weeks earlier, they might just have managed it without the help of 1860 Munich. Paderborn have likely been spared an arduous task. Coming back up from the fourth tier is very difficult. To have any chance of bouncing back into the third division, Paderborn would have needed to win the Regionalliga West outright. And, while there are three places in the third division up for grabs every season, they are split between the five regional leagues: Bavaria, Nord, Nordost, Südwest and West. Six teams go into the promotion play-offs – the champions of each league and the second-placed team from the league with the most clubs (this year it was Südwest) – where they play each other home and away for the golden ticket back into the bottom floor of the Bundesliga. Paderborn have shown signs of life under Baumgart, who has committed himself to the club. Just days after their relegation, they lined up for the final of the Westfalenpokal, one of 21 regional cups that is effectively a qualifying tournament for the DFB Pokal, the German Cup. After serving up a season of misery and struggle for their fans, they were at least able to give them something to cheer about by winning the final 3-1. Scant consolation maybe, but the victory and the funds that will come from appearing in next season’s DFB Pokal may just provide a touch of solid ground to halt the downward spiral. They will be even happier if and when the Bundesliga confirms that 1860 Munich have been demoted and their position in the third tier is secure. Regardless of which league Paderborn compete in next season, their fans will hope that the only way is up. And those walking the 82.3 metres down the Stoppelkamp Allee may be thinking “there but for the grace of God”. Next End of an era? Jason, thanks for writing about the Paderborn club. Has there been any recent news out of Germany regarding 1860 Munich’s situation?